Split Flow Technology — Furnace Improvements Services Inc. 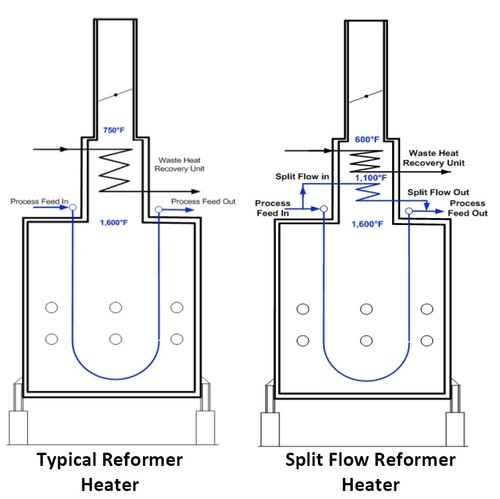 When refiners wish to increase the capacity of their fired heaters, “Split Flow” aims to improve the utilization of thermal energy for process heating. Main Stream: The fluid in the first stream is heated predominantly by the convective and radiant heat transfer mechanism. Split Stream: The fluid in the second stream is heated predominantly by the convective heat transfer mechanism. The streams are then combined at the heater outlet. This technology has been used very successfully for capacity increase revamps of fired heaters particularly in Platformer heaters. It is suitable for increasing the capacity of a heater by 15‐30%. © 1996 - 2019 Furnace Improvements Service INC. All rights reserved.